AL Miezan Association for Human Rights Development in Iraq received support from MRG as part of Strengthening Human Rights Advocacy for Freedom of Religion and Belief in the Middle East and North Africa..
AL_Miezan carried out a project in Amarah City, Maysan Province to encourage peaceful coexistence between the Muslim majority and minorities, like Sabean-Mandaeans, in Iraq through community dialogue. The project started in October 2017 and included a number of activities, such as a discussion session held in Amarah city with the police administration, Mesan diwan, governance council, representatives from human rights organizations and representatives of the Mandaean community. A monitoring team to document violation against minorities was also set up. The team met with men and women in their homes and work places to listen to their problems and to report and document violations. A report of human rights violations was then written and submitted, along with official letters, to the Governor’s office, police directorate, education directorate, human rights commission and journalists’ union. AL_Miezan also produced three radio shows and which were broadcast on local radio stations in Mesan Province. 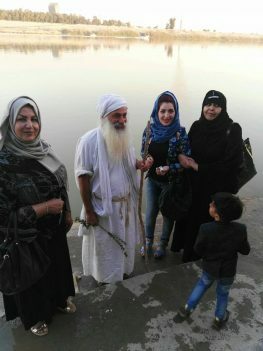 The radio shows discussed peaceful coexistence between different sects in the community and introduced the Mandaean minority and their role in the community. In addition, the project included a visit to a Sabean-Mandaean temple in Amarah city, led by Mrs. Roqia Al-Nori, the head of the human rights committee in Maysan province council. As part of the visit, they had a meeting with the high representative of the Mandaeans in the city, Sheik Netham Kredi, and the chief of the Mandaean affairs council in Maysan, Dr. Qasem Mohawi. As a result of this project, authorities and police forces in Maysan province pledged to provide the necessary security to prevent rights violations against the Mandaean community, especially in areas where they work or live, and promised to guarantee prosecution of anyone who attacks them. The Directorate of Education sent an official letter to schools asking to them to prevent and reduce violations against students who are members of religious minorities in the province, and to encourage a culture of peaceful coexistence and tolerance in school environments. The Municipal Directorate was also prompted to carry out a campaign to clean up and remove waste near the Mandaean temple, after this problem was raised in the dialogue seminar by representatives of the Mandaean community. Mandaeans are followers of one of the oldest monotheistic religions. Their language is Mandaean which descends from the Aramaic language. They historically settled in southern Iraq, mainly in Maysan province. Given the importance of water in their faith, their stability revolves around rivers. Some of them currently live in Baghdad, but since 2003, some have been displaced to the cities of the Kurdistan region, especially Sulaymaniyah and Erbil. Iraq has many different minorities, such as Chaldeans, Ashurians, Armenians, Syriacs, Yazidis, Sabean Mandaeans, Shabaks and Turkmen, and the issue of minorities is particularly relevant, especially after the establishment of the Governing Council in July 2003 on the basis of sectarian and ethnic quotas. National and religious minorities complained about the marginalization of their role and the lack of political representation in existing power-building arrangements. Moreover, violations against minorities in Iraq, including Mandaeans, increased during the sectarian war in 2006-2008 and ISIS invasion in 2014.